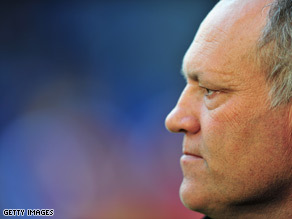 (CNN) -- Eredivisie giants Ajax Amsterdam have announced that Martin Jol has signed a three-year contract to coach the club, starting from July 1. Jol has signed a three-year contract to take over as coach of Dutch giants Ajax from July 1. The 53-year-old Dutchman moves from German side Hamburg, where he had recently secured a European place with a fifth-placed Bundesliga finish -- as well as leading the club to the semifinals of this season's UEFA Cup. Jol has also coached Den Haag and Roda -- with whom he won the Dutch Cup -- in his homeland. However, he really came to prominence at Tottenham Hotpsur, leading the London side to consecutive fifth-placed finishes in the English Premier League. Ajax chief executive Rik van den Boog, told the club's official Web site : "Martin has all the qualities that the new coach of Ajax should have in our opinion. "He is experienced and has gained that experience both in the Netherlands and abroad. He has worked for big and not so big clubs and has shown he can get the maximum potential out of his players. Jol's appointment comes after Marco van Basten resigned earlier this month, following a disappointing season for the former Dutch national coach. Under van Basten's tenure, the four-time European champions failed to qualify for next season's Champions League. A delighted Jol told the Ajax Web site: "Ajax are a fantastic football club and I am really looking forward to getting started. "I had a great time at Hamburg, it is a big club and a nice city to live in. I have worked abroad the past years and now I get to return home, I am looking forward to that too." As a player Jol, turned out for Dutch sides Den Haag and Twente, before moving to Germany with Bayern Munich and then later to England with West Bromwich Albion and Coventry City.